A captivating and chilling offering from the Chicago MC. 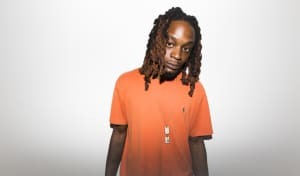 Eager Chicago MC Brian Fresco has delivered a cinematic video for his song, "Call," which is premiering on The FADER today. In the uncanny visual directed by Peter Collins Campbell, Fresco sits in a room where everyone else moves in slow motion. As he raps with a joint in his hand, all the party guests star off into space with paint dripping down their foreheads. The true madness begins to unravel as an unsettled woman enters the space, taken aback by the unearthly event that transpires. Over email, Fresco wrote, "Sometimes we are involved in things and see others involved in things that we know are harmful to ourselves, yet we really don't acknowledge it until something goes wrong." He continue, "In other words, we don't see the potential pitfalls of the things we do to ourselves when taken to far."